Does your PC Software produce Alerts? Internet Users - Why should you wade through volumes of SPAM, before you can read your Email? Instead, let us ZAP your SPAM! We have installed our SPAM Zapper - Tools in ISPs Servicing thousands. Our solutions make your Email Reliable, Securing and Dependable. We'll also remove the potential threat of Identity Theft from your Email as well. Now you can get the Industrial Tools for SPAM without the expense or maintenance of one. Our service is so easy to use, that even seniors on social security can reap the benefits of the spam zapper. When you select our SPAM Zapper on-line service, we will increase your available Internet Mail Storage by the amount you select with us. Our Basic Email Filtering Package includes 10 MB of on-line storage, if your ISP also has allocated 5 MB of Storage, you can Triple it with our Filtering Service ( 5 MB from your ISP + 10 MB Basic Service = 15 MB of OnLine Storage). We provide Email Hosting, and have Web mail access so that you can get your Email anywhere on the Internet. While we can easily retrieve your email from your current ISP, they will undoutably accept more Spam than we would. 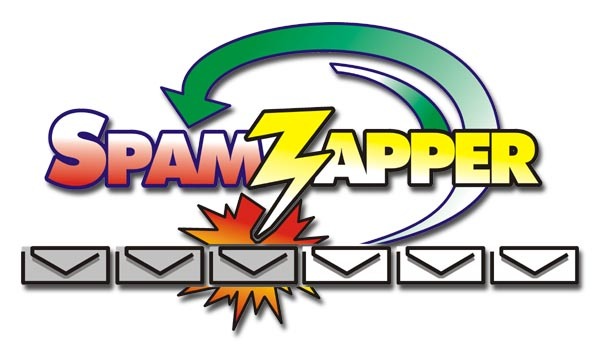 In this case we will be able to identify the Spam, in order to reduce the spam further, we recommend that you accept one of our free email addresses at Spam-Zapper.com, No-JunkMail.com or spamzapper.us (or any Domain name which we can Host or protect). If you want to register your domain name, why not host it here? First and Foremost, We Survived the Blaster and SoBig Attacks without going down! How many Banks did you know that went down? What about your ISP? Or your WorkPlace? We have the tools to keep your Mail and Servers Safe. You have the benefits of staying with your ISP and getting additional Email Storage with our service which can double or triple your Email Storage for pennies a day). You can have your Current Email address AND a New one for Special use. YOU choose which to use when. We can Transfer your Email Address to our Domain, and we will alert everyone in your Mailing List for FREE. As new SPAM Signatures are developed, we will keep pace with them in marking what is SPAM. All of your Email is Scanned for Viruses, 24 hours a day, 7 days a week. Our Virus scanners are updated daily. We provide you with Redundant Services, Capturing ALLof your Email, some ISPs only have a single server for their Email support. We have redundant servers in place for constant Email processing. We report the SPAM and accept complaints to forward to the proper authorities as well. All of the while we protect your identity and secure our servers to keep your information safe. We are Certified in Homeland Security, and implement the Best Practices and Standards in the development of our filtering services. Our Filtering Service works better because we can review the trends of Email being sent to MORE Users. Trends for Processing SPAM are much easier to locate when they are reviewed for Multiple Users, rather than just one user. We have been asked several times about how we can filter your Email. The easiest way for us to explain this is with the following diagrams. When a Friend that you know wants to send you an Email Message, they compose the message on their PC (A). Your Friend's ISP (B) then accepts the Email message for delivery and forwards it through the Internet (C). The Internet routes the message and delivers the Email to your ISP (D), and you receive the Email on your PC (E) when you request it from your ISP. We have depicted that your ISP can use either POP3 or IMAP Service (D), as we are compatible with both protocols. You do not need to worry about these Technical Issues, that is what our Service is all about. When your customers ask about what they are getting for their money, show them the number SPAM Messages you've identified. While some ISPs know that more than 85% of the incoming E-Mail is SPAM, the average Customer is generally unaware of what it takes to provide the level of service you give them. We give you the tools and the data to set your business apart. We start out in a similar manner as we are not changing the delivery of Email, just how it is processed for the SPAM Filter. Your friend decides to send another Email to you, and they compose the message on their PC (A). Their ISP (B) accepts the Email message for delivery and forwards it through the Internet (C). The Internet routes the message and delivers the Email to your ISP (D). This is where Our Servers Retrieve your Email (after you tell us where to get your Email). We retrieve your Email from your ISP (D), and then deliver it to our Filtering Servers (F). When you decide it's time to retrieve your Email on your PC (E) you will retrieve it from our servers (F), already filtered, scanned for viruses and untouched. You will not notice any appreciable delays in getting your Email, in fact you will be relieved in knowing that your Email is safe and protected and that you can now easily tell what is SPAM, and what is actual Email. Does your PC filtering Software produce Alerts? If you are getting Netscape Alerts or alerts from your SPAM Filter software running on your PC, we have the answer for you. The SPAM Zapper software runs on the Server which initially receives your Email, so by the time you are ready to collect or read your Email, the Filtering process is already done! There is no need to to worry about running out of PC Resources. You will not get any more error messages from the Software Packages, and now your filtering is based on Many Users, giving it a broader base for scanning potential. All of this provides for Better scanning and more power on your PC to perform what you want on it, instead of dedicating your PC to becoming a SPAM Filter platform. Have you ever heard of the old saying, "There is safety in numbers"? Well, this holds especially true with SPAM Filtering. Because we process mail for multiple users, we are identify SPAM - as it occurs! When was the last time that Your ISP displayed the number of Virus Messages or the number of SPAM Messages that they identified? We can identify the SPAM messages for you to help eliminate the UCE (Unsolicited Commercial Email), as well as limiting the threat to you from the Theft of your Identity. Our Anti-Virus software is automatically updated to provide you with the greatest protection. In a normal POP3 configuration, we will send all of your mail to you with a Header indicating which messages are SPAM, and which are not. Your Mail reader can then easily sort through the messages to organize them into the proper folder. We are also offering a Free upgrade to the IMAP Protocol ad will automatically sort the Email for you and create a folder for your INBOX and your SPAM Mailbox. When you are ready to sign up for our SPAM Filtering Service, we will be ready for you. Can immediately begin filtering your E-Mail as soon as we get some information about the about your Email Address and Contact information. "I really Love my Netscape Mail now that my SPAM is being Filtered!"